Successfully Added HK Warehouse HOMTOM HT17 Pro Smartphone - 5.5 Inch, Android 6.0, Quad Core CPU 2GB RAM, 4G, Fingerprint ID, HotKnot, OTG (White) to your Shopping Cart. Looking for an affordable large screen phone that offers more for your money ? If so, the HOMTOM HT17 Pro is a great choice. this large screen Chinese smartphone packs in a 5.5 inch display, Quad Core CPU, Mali GPU, 2GB RAM, 4G, Fingerprint scanner, Hot Knot, OTG and comes with Android 6.0 making it an attractive all rounder for about $80. The huge 5.5 inch display with 1280 x 720 pixels has a good color range and respectable brightness so you can certainly enjoy videos and movies while the responsive multi touch screen makes for enjoyable gaming. A power efficient MTK6737 Quad Core CPU supported by a Mali T720 GPU and 2GB of RAM means the system runs smoothly and several apps can be opened without experiencing any delay or lag. It has enough power to accomplish all you need from a typical days usage while ensuring your battery won't run flat part way through the day. Despite its large 5.5 inch screen the HOMTOM HT17 Pro is still easy to grip and use inone hand, partly due to the textured sides that prevents slips and drops but also because of the excellent software features. These Smart wake and gesture features make it easy to open an function from the locked screen by just drawing a character on the screen, you can also set it up to answer calls by lifting the phone to your ear and a whole lot more. Allowing for fast connectivity the HOMTOM H17 Pro supports support 4G networks and also takes advantage of HotKnot, OTG and Bluetooth technologies for a full complement of speedy connectivity. Coming with 16GB of built in memory, external storage for up to 64GB extra data and having Android 6.0 with its Google Play store working out for the box there's almost no limits to the apps, and games this phone can support. 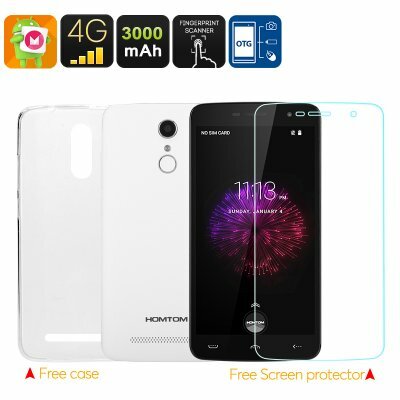 The Large Screen HOMTOM HT17 Pro Smartphone comes with a 12 months warranty, brought to you by the leader in electronic devices as well as wholesale Android Phones..
my kids love it! i was sursprised with intense gaming that the phone did not heat too much against some phones in its class. the phone can stand a beating. i never regret to buy two of these for my kids.